This video was shared on Blame It On The Love's Facebook page back in March, but here's a piano/vocal version of a Bon Jovi classic... Livin' on a Prayer. I was told that the singer, Olivia, is 14 years old. What do you think of Georgia and Olivia's cover? As far as Bon Jovi goes, I've been sharing bits and pieces on Blame It On The Love's Facebook page so come over and like us if you haven't already. 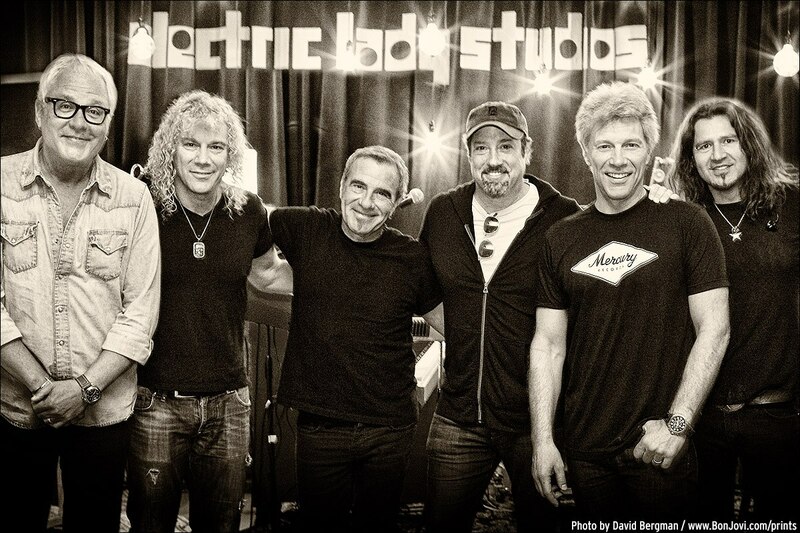 The biggest news on the Bon Jovi front is that the band has completed its latest album, This House Is Not For Sale. And after spectacularly parting ways with Mercury Records when they released Burning Bridges last year, they are now back with Mercury/Island/Universal Music Group. Go figure! 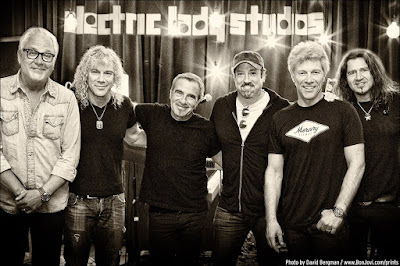 Hugh McDonald, David Bryan, Tico Torres, John Shanks (producer), Jon Bon Jovi, Phil X.
I must say, I do like the fact that Phil X is in this photo because it implies that he recorded on the new album -- as he should, given he works as a session guitarist and is likely to be playing these songs on tour. I was worried that they would just use John Shanks as the guitarist in the studio like they did on Burning Bridges. "I haven't seen him in over three years. He just didn't show up for work anymore. And that's the truth of the matter." Which is pretty sad really. I don't mean that in a judgmental way; simply that many of us know first hand how quickly someone can go from being a massive part of your life to being virtually nothing. "The great thing about country songs is the storytelling. They're really moving and well-crafted, and that's something Richie and I wanted to explore. "There are songs where I'm just singing and he's backing me up, and vice versa, and songs where we're singing together... It really takes you on a journey, and there's a great blend to our voices." Read the full article at Rolling Stone. So, what do you think? Looking forward to the new album(s)? Filled with dread? Somewhere in between? Let me know.